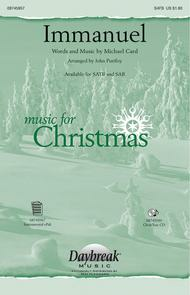 Michael Card's classic worship song Immanuel has been sensitively arranged for SATB choir and strings, creating a warm and worshipful anthem for the Advent or Christmas season. “And if God is with us, who could stand against us? 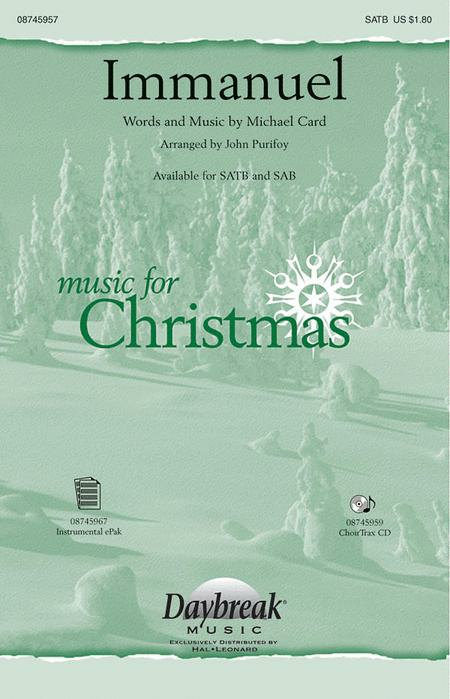 Our God is with us, Immanuel.” Orchestration for strings, woodwinds and percussion available.Available separately: SATB, SAB, ChoirTrax CD and ePak(O). Performance Time: Approx. 3:55. This arrangement is not the same as Paul Leddington Wright's which you can hear on YouTube. Similar, but not as grand. October 13, 2008 What a Beautiful Piece of Music! September 24, 2008 Love the song, would like a different arrangement. Although this arrangement is pretty, I was hoping on a better arrangement. It is pretty simple to learn, but I think they four parts could have been arranged a little better. Still you will like the arrangement, just I wanted something better.